LOS ANGELES (KTLA) -- A railroad-crossing arm went completely through a school bus and ended up in a kid's lap following a bizarre crash in the Central-Alameda neighborhood of South Los Angeles Tuesday morning. 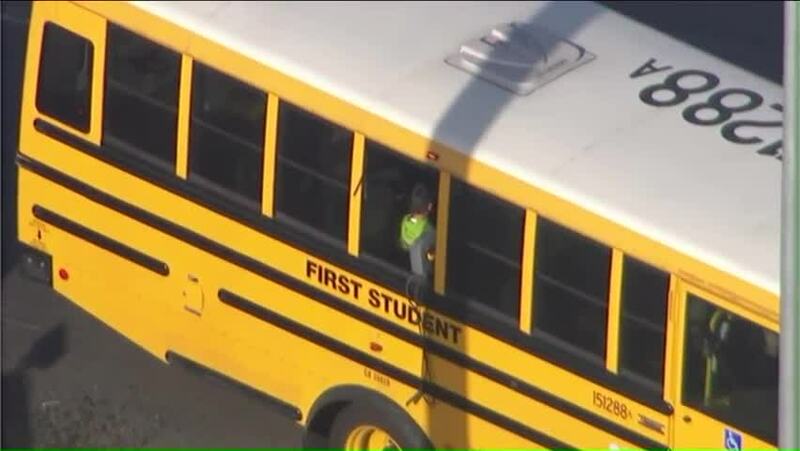 Aerial video from Sky5 just after 7:30 a.m. showed the yellow school bus stopped near some railroad tracks with the crossing arm sticking out of a broken window. The school bus had apparently tried to cross the tracks near the intersection of East 55th Street and Long Beach Avenue when the crossing arm somehow impaled the bus and went completely through to the other side. It was unclear how many students were on the bus at the time of the crash, but one child could still be seen in his seat with the crossing arm lying in his lap. A firefighter eventually boarded the bus and moved the crossing arm away from the child. Video appeared to show the child smiling as he moved around after being freed from the crossing arm. Firefighters then used a rotary saw to cut and remove the crossing arm from the bus, spokesman Erik Scott with the Fire Department stated. No injuries were reported in the crash, according to Scott.